In this conversation, K.P. Yohannan shares his thoughts about the future of the Church and how to maintain its heart in a world fighting to destroy it. What do you see happening in today's Christianity? In the book of Jude, the Lord through His servant tells believers to "contend earnestly for the faith which was once for all delivered to the saints." He then goes on to say that ungodly people had crept into the church unnoticed and were luring people into a gospel not preached by Jesus or His apostles. Those words were written at the start of the early church, nearly 2,000 years ago, but they are just as much true today as they were then. For the past few decades, the Church has been struggling to catch its breath under the tidal wave of liberalism. It is commonly believed by leaders in denominations across the board that we are living in a post-Christian era. I've been saying this for the past 15 years, while many others have written articles and books about this very thing. Rod Dreher wrote a book called The Benedict Option about the state of Christianity in this culture and era. It's a book I highly recommend and encourage you to read. Dreher talks about the changes in culture that have affected the Church: the Protestant Reformation, the age of Enlightenment, the Industrial Revolution and the Sexual Revolution (which is still radically defining our culture and Church). Liberalism has threatened to all but wipe out the Christian faith. Yet, while the Church still stands, it suffers, "ineffective in combatting the forces of cultural decline," as Dreher put it. Modern Christianity acted as if by compromising in this issue or in that issue and becoming more like the world, the Church could win. "They will see how much we are like them and join us." Instead, the world won. And the Church has mostly forgotten what it truly means to "walk just as [Jesus] walked" (see 1 John 2:6). What do you think the future holds for Christians striving to live out authentic faith? If the past is an indicator of the future, then it seems that either the Church will continue to compromise or followers of Christ will need to learn to live in a world that is growing more and more hostile toward our values. It will become increasingly difficult to stand strong on the Word of God, especially when it is radically different than the cultures we live in. Jesus Himself was revolutionary in the way He lived, and He suffered for it. The Lord has warned us over and over in His Word of what is to come for those who believe in His name. Just read the book of Revelations, and you will catch a glimpse. Because we are living in a post-Christian era, we will be attacked for choosing to live according to the Bible. News headlines over the years have proven how true this is. Persecution and opposition is nothing new for believers. Christ told us this will happen to all who believe in Him. For believers in the East, persecution is a normal-and expected-part of their faith. From day one of their new life in Christ, they may experience some sort of opposition. But for believers in the West, who have not been beaten or shamed for their faith, it will be a new challenge to overcome. How can believers live out an authentic Christian faith in a world that is growing hostile toward our faith and values? I often think about the early Church fathers and the way they lived. They were deliberate in totally separating themselves from the culture around them, even from the cultures they grew up in. They did this to maintain their relationship with the One who gave His very life so they could live. They separated themselves to pursue a more holy and pure walk with God. "But, dear friends, remember what the apostles of our Lord Jesus Christ foretold. They said to you, 'In the last times there will be scoffers who will follow their own ungodly desires.' These are the people who divide you, who follow mere natural instincts and do not have the Spirit. But you, dear friends, by building yourselves up in your most holy faith and praying in the Holy Spirit, keep yourselves in God's love as you wait for the mercy of our Lord Jesus Christ to bring you to eternal life" (verses 17-21). These early Church fathers took this mandate seriously. They kept themselves in God's love; they built themselves up in their most holy faith by returning to the roots of Christianity; and they prayed in the Holy Spirit and spent time meditating on His Word. They practiced holy habits of the heart. But they didn't do it alone! Yes, they separated themselves from the world, but they joined themselves to others who were desperate to walk as Jesus walked. They formed communities and did life in common together. They were there to encourage and keep each other accountable. Dreher says in his book that we, together, "have to choose to make a decisive leap into a truly countercultural way of living Christianity. … If we want to survive, we have to return to the roots of our faith, both in thought and in practice. … In short, we are going to have to be the church, without compromise, no matter what it costs." I agree with him, and I believe that is what Jude is talking about. We have to contend earnestly for our faith. We need to make deliberate choices to protect our relationship with Jesus and stay true to His values. What are you calling the Church at large to do during this age in time? We are called by God to be agents of reconciliation between a living God and a broken world (see 2 Corinthians 5:18-19). God is not surprised by the way things are within His beloved Church. He loves us still and keeps inviting us to "look, and ask for the ancient paths, where the good way is; and walk in it" (Jeremiah 6:16). Looking back at the first 300 years of the Church gives us a clue as to how we are to walk like Jesus. See how the Apostles and the desert fathers and mothers lived their life devoted to obedience to God. They didn't compromise. Instead, they surrendered their wills to Christ, they lived in accountable community, they focused on serving others. They spent their days in solitude, meditation, prayer and worship, developing holy habits of the heart. Their spirituality wasn't about themselves. It was about Jesus. So much of today's worship and church practices can become about the self. We can lose our focus on Christ and instead go to church to hear a renowned man or woman speak, to be entertained by the worship or to fill our heads with more knowledge. But the Bible says it's all about God. Look at the account in Exodus, where God tells the king of Egypt to let His people go. Why? So they can worship Him. God looks for people to enter the worship that's already happening in heaven! Read Isaiah 6 and Revelation 4-5. Worship is happening right now in heaven, and we get to join in. That should encourage us. Now, we must ask ourselves: Where do we go from here? Will we compromise the purity of God's Word? Will we compromise our standard of moral living? Will we compromise our total surrender to Christ, who promises a life of abundance in Him? Let us choose the ancient paths. Let us choose to walk as Jesus did, embracing the suffering that will come with it. Let us choose to please Christ and Christ alone. USA - Gospel for Asia staff joined hundreds of volunteers at Samaritan's Purse Operation Christmas Child (OCC) processing center in Dallas, Texas, on Dec. 2. Around 23 staff members, including School of Discipleship students, took part in ensuring boxes filled with little treasures for children in need around the world were ready to ship overseas. "It's always a joy to be part of kingdom opportunities like OCC," said GFA's vice president, Daniel Yohannan. "Helping children is part of the heart of God. I'm so glad that our staff and students could work with so many others who have the same heart for the Lord and love for children who are in the greatest need." During their four-hour shift, the GFA volunteers helped with a variety of tasks, including sorting shoeboxes by age and gender of the recipient, inspecting the gifts, scanning labels so donors can know the destination of their box, and loading cartons of shoeboxes onto pallets. Kendra, GFA staff, helped organize and prepare the GFA volunteers to serve at the processing center. Before coming on staff, she had the opportunity to hand-deliver shoebox treasures to children in the Philippines. "Watching these kids' faces light up as you hand them each their very own shoebox, and joining them in their excitement as they grin, laugh and squeal over what's inside-there's so much joy in those moments. So many kids realize for the first time that they are genuinely loved because of these tangible gifts." According to the OCC website, shoeboxes are shipped to "children affected by war, poverty, natural disaster, famine, and disease; and to children living on Native American reservations in the U.S."
Helping those in greatest need is at the heart of GFA's ministry. As it lives out one of its core values of "being a people who work together with the Body of Christ," GFA hopes to come alongside Samaritan's Purse again in the future and be a source of hope for children in Asia and across the globe. "We praise God for Franklin Graham and Samaritan's Purse," Daniel said, "and all they do to help children who are desperately in need of hope, help and love." ASIA - In November, K.P. Yohannan, GFA founder, visited a leprosy colony where GFA-supported Sisters of Compassion serve. 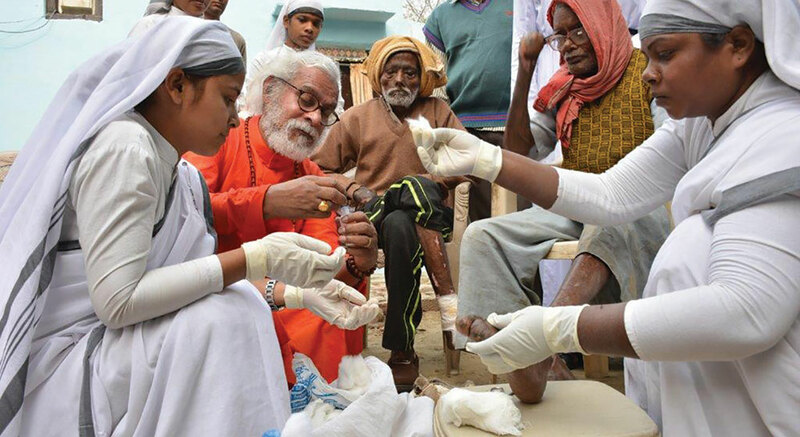 He helped clean the wounds of leprosy patients and give away blankets to keep them warm during the impending winter season. "It was humbling to see the joy on the patients' faces as they worshiped the Lord and as our sisters cared for them," Yohannan said. "Those who were once the rejects of their society are now being loved on and protected. Our precious sisters represent Christ so faithfully, following His example to serve the least of these." GFA supports ministry in 44 leprosy colonies across Asia. Some of these colonies can have up to 5,000 leprosy patients-many of whom, if not all, had been forced out of their homes or abandoned by loved ones after being affected with the chronic disease. Around 500 GFA-supported Sisters of Compassion serve among them, in addition to other national workers. Apart from visiting with leprosy patients, Yohannan also visited a tailoring center where 15 women are currently learning how to sew. This center had already trained 2,500 ladies, and each were given a free sewing machine so they can escape from the cycle of poverty. "Whenever I have the opportunity to visit the work the Lord is allowing us to be part of, I can hardly believe it's real," Yohannan said. "I never imagined all He had in mind. It's such a privilege and honor that we have to be His hands and feet to the hurting and dying in our generation." You can keep up to date on Brother K.P. by following his Facebook page (facebook.com/kpyohannan) or his blog (kpyohannan.org). ASIA - Throughout November and December, more than 200 GFA-supported missionaries and pastors serving in one region received warm winter clothing to prepare them for the upcoming cold weather. 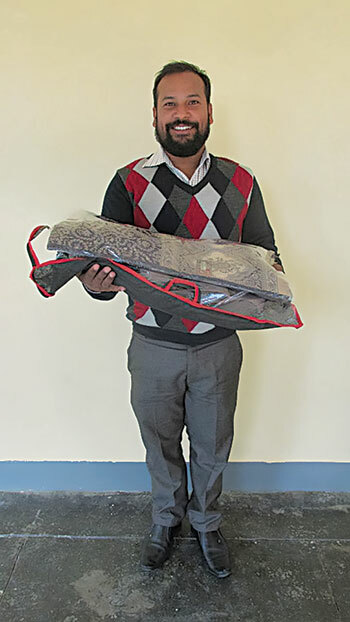 Now, with new jackets and shawls to protect them-and their families-against severe cold, GFA-supported workers can confidently continue their ministry despite serving in a region along the Himalayas that can be especially harsh during the winter season. "They are wearing the warm clothes and visiting the believers every day to encourage them from the Bible to remain strong in their faith," said a GFA-supported field correspondent. "At the same time, they are able to go out and share the love of Christ to other people too." Pushpa, a GFA-supported woman missionary, was one of the more than 200 winter clothing packet recipients. "These days," Pushpa said, "cold is increasing rapidly. I received warm clothes at the right time. It looks good, and I am sure it will keep my body warm. I am thankful to my church for the love that it has shown me." GFA is grateful to help keep our brothers and sisters on the mission field ready to minister even through challenging seasons. To learn more about keeping national workers warm, visit gfa.org/ministries/winterclothing. USA - On Jan. 20, around 20 GFA staff and School of Discipleship (SD) students gathered around long, rectangular tables to eat homecooked meals, share stories about God's faithfulness and to adore Him in song. It was SD's bi-annual Celebration Potluck event-an event meant to cultivate the practice of remembering, declaring and praising God for His faithfulness. Susan, a GFA staff member and SD graduate of 2011, attended the event. "I mostly attended the potluck to enjoy some time with the current students and SD team members and get to know them a little better," Susan said. "But something more significant happened than just having nice fellowship with people. As people around the table took turns sharing incredible stories about what the Lord had done in their lives and expressing their gratitude to Him, I found myself deeply encouraged. By hearing others proclaim their own unique stories of God's faithfulness, I was reminded to keep hoping in Him in the face of the challenges I personally have been walking through." Many who have attended can echo Susan's words and have come away with a renewed sense of God's goodness. That's what happened to Erinn, a current SD student from Arizona. "God has blessed us in so many ways," she said. "He has given us things that we have not asked for or even thought. … God cares about the big and the small issues of our lives-He cares for our whole being." 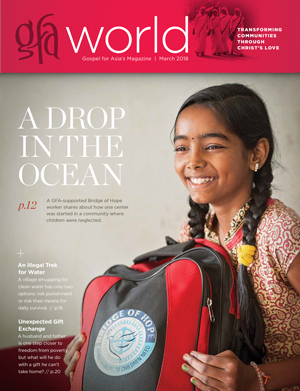 To read articles written by SD staff and students, visit disciple365.org. A rock whizzed through the air and found its target. A boy held his head in pain as blood streamed from his wound. Chakshu observed the result of his accurate aim. Only 6 or 7 years old, and he was already a troublemaker. Madhuri, Chakshu's mother, remembers that afternoon when her son threw a rock at another boy's head. She remembers how she used to worry about the things Chakshu did during the day while she worked as a maid. She remembers his tantrums, his refusal to do anything she asked him to do. 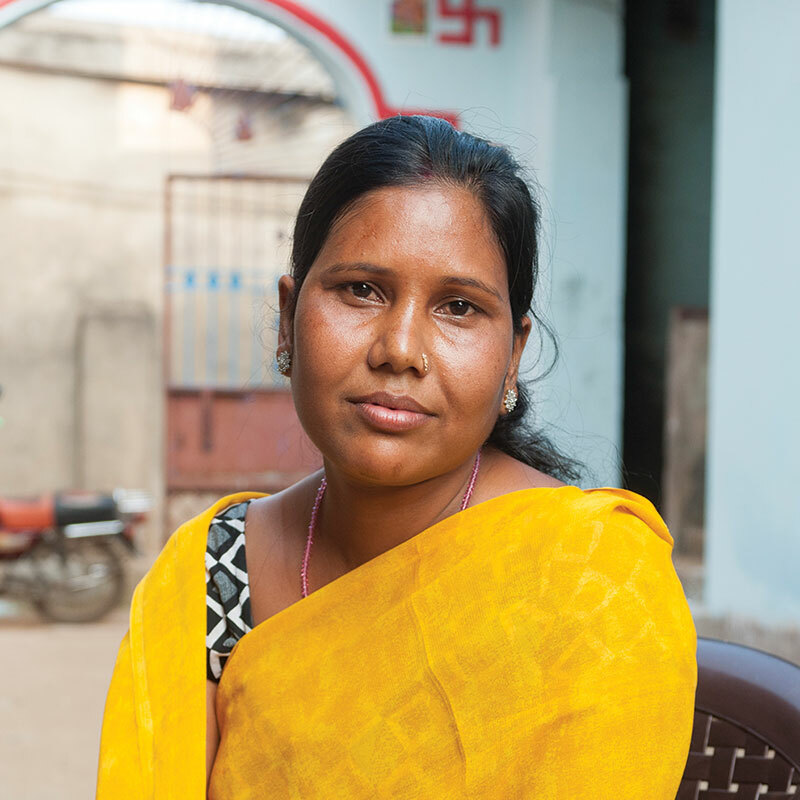 Abandoned by her husband while pregnant with Chakshu, Madhuri worked hard to provide for her fatherless son. She wanted the best for Chakshu, but even buying school supplies, toothpaste or shampoo was difficult. And what little Madhuri could provide, Chakshu ignored. Instead of gratefully going to school, he roamed around, playing-or fighting-with friends. When he did occasionally attend school, he caused trouble in class. At home, Madhuri had to put up with her son's disobedience. But those memories are now in the past. Because of the intervention of a GFA-supported Bridge of Hope center, Madhuri is making new memories with her son that are very different from her old memories. "After he joined Bridge of Hope," Madhuri says, "there are so many changes in him." The simple love, instruction and examples from the Bridge of Hope teachers transformed little Chakshu. Chakshu began waking up at 6:30 a.m. to comb his hair and wash himself thoroughly before going to school and the Bridge of Hope center. He applied himself to his studies. His teachers reported a dramatic change in his performance and attitude, and his mother noticed the change too. "Earlier, he was very disobedient, but now, now he is changed," Madhuri says. "If I ask him to fetch some water, he will happily go and do it, which he didn't do earlier. Earlier, if I asked him to fetch some water, he would throw the bottle and say, 'I will not bring the water.' ... Now if I am sick, if I am feeling a headache, if I ask him 'Son, can you help me?' he will even help me with massaging my head. That kind of love and care he shows." Although Madhuri once anticipated her precious son would grow up to be a scoundrel and uneducated, now she doesn't worry about his future. Through Bridge of Hope, his character is developing into a hardworking, loving boy who values the opportunity to go to school. Above all, Chakshu receives love and wise counsel through his teachers. Madhuri's heart overflows with gratitude towards those who have invested in improving her child's life. Her financial burden is lightened now that Bridge of Hope provides all the supplies, books and uniforms Chakshu needs-and even extra gifts like blankets, soap, shampoo and warm clothing. But Madhuri values her son's character transformation even more. "The greatest blessing that I have," she says, "is that my son is changed." Alisha gave a furtive look over her shoulder as she prepared to fetch water across the railroad tracks. If she was caught, she knew she would be punished. Crossing the tracks was illegal…and dangerous. But her family needed water to drink, to survive, and this way was the shortest route to the nearest well. Water, that precious and valuable commodity of life, was worth the risk and punishment, but still Alisha hoped she wouldn't be caught. Alisha lived with her husband and two children in a hut located in a slum made up of around 100 families that depended on manual labor for their income. The water scarcity in their village made slum life only more difficult, especially when it meant spending a good portion of the day walking just to get a few gallons of water that was possibly laden with disease-causing bacteria. There was a short route and a long route. One meant risking life and punishment if caught by the train or local authorities. The other meant risking work, which meant risking money that would get them through another day. "In all their struggles," reported a GFA-field correspondent, "much time was spent [fetching] water, and Alisha's family and other people could not concentrate on their work, which brought financial problems in their lives." Disheartened by their situation, Alisha shared with her pastor, GFA-supported pastor Misal, about the daily struggle for water she and the other slum families faced. He listened intently and encouraged her to keep trusting in and praying to God for a solution, while he petitioned for a Jesus Well. On February 28, 2015, the Lord God answered Alisha's prayers when He provided her and the other slum residents with a bore well in their own village. No longer did they have to cross the railroad tracks illegally. No longer did they have to waste precious hours walking to find water. Now Alisha and the 100 other families could walk a few meters to taste sweet water without having to look over their shoulders in fear. This Jesus Well brought so much joy to the villagers and revolutionized the way they spent their days. It also cultivated a deep trust between Pastor Misal and the slum residents, who now understood the pastor's love for them. For three years, the Jesus Well has been providing fresh and clean water to Alisha's village, even in the driest summers. Through it, the Lord shows His love and power to all who come thirsty. Tanya, 40, lived alone in a small thatched hut. She spent most days hidden in the shadows of silent pain. Occasionally, neighbors would peer through the doorway, faces full of pity, offering money and other necessities for Tanya's survival. They never stayed long. As they walked away, Tanya could hear their happy chatter as they talked about their husbands and children, words that sent pangs throbbing through her heart. One day Leena and Madhuri, believers from the local church led by a GFA-supported pastor, went to visit Tanya in her cramped home. The forlorn woman shared how she came to be in her condition. She had been married and lived with her husband and children in a village some distance away, but her sorrows began when she lost her husband. After his death, her children did not comfort her in her grief. Instead, they turned on her in anger and chased her out of her home, threatening her to never come back. As was common within her culture, they blamed Tanya for their father's death and saw her as a curse. They left their mother destitute, with nothing. Tanya ran from their village with a broken heart and no way to provide for her needs. When she came to this village, she built the small thatched hut to hide herself away. Then one day, a wild elephant tore through the area and trampled Tanya's hut. She had no one to turn to for help and had to rebuild her hut all over again. Leena and Madhuri's hearts ached as they heard of her pain and rejection. They shared about Jesus' love for Tanya, which encouraged the poor widow. After that visit, hope birthed in Tanya's heart. She invited the women to visit again along with the local Women's Fellowship. Leena and Madhuri came back and encouraged Tanya from God's Word. Soon, the widow felt her burdens and sorrows ease as she embraced the love of Jesus. "Unfortunately, I have lost my husband," Tanya said. "But instead of him, I got a new friend: Jesus Christ. He is not going to leave me as my children did." Widows in Asia are often excluded from society. Without any resources, many become destitute. In such vulnerable circumstances, they are often taken advantage of and victimized. But Jesus cares deeply and wants to protect them. Let's pray that many widows in Asia will experience Jesus' love. In a tale from ancient India, four royal princes discussed their future. Since each one desired to master a different branch of science, they separated to pursue their studies. Later, they met at an appointed time and place to share what they had mastered. The first prince announced, "With nothing but a bone of a creature, I can grow flesh on it." The second one added, "I know how to grow a creature's skin and hair if there is flesh on the bone." The third prince declared, "I have mastered the science of growing limbs if I have a bone that has flesh, skin and hair on it." The fourth one proclaimed, "And I specialized in how to give life to a creature provided it has flesh, skin and limbs." Pleased with their combined expertise, they decided to venture into the jungle in search of a bone. When they found one, each performed their mastered skill, and they created a huge, living beast: a lion. The ferocious beast arose, jumped on its creators, and with its terrible mouth, sharp teeth and claws, it killed them and then vanished. The moral of the story is: "Watch what you create; it could kill you." These Scriptures shows us that if we want to know the Lord, we need to set time aside to seek Him and be with Him. It sounds very simple, but our 21st-century lifestyle does not help us focus on one thing or one person without being distracted. We are constantly busy or preoccupied with social media. For many of us, it's nearly impossible to have a normal conversation or sit still in church without checking text messages and emails. Our minds are restless and unable to quiet down. Our global culture, in the process of making life more convenient with material things, is creating ever-faster communication, instant access to worldwide information, and entertainment. As a result, people are losing important relational and life skills, such as focusing their attention on one task, really listening, thinking deeply, reflecting and being still without any noise bombarding their brains. This constant busyness creates a huge vacuum in people's lives as well as isolation and emptiness. It reminds me of King Solomon who after achieving everything he desired concluded: "Vanity of vanities, all is vanity" (Ecclesiastes 1:2). What we experience looks like a repeat of the Indian tale: What we created is devouring us. Please understand, I am not saying all social media inventions and gadgets are bad; I, too, use some of them. However, I am concerned about the way they tend to control and change our behavior. You see, the constant busyness within ourselves and the desire to surround ourselves with unending input affects our relationship with God and our ability to hear His voice. It reminds me of when I got my first digital watch. I thought it didn't make any ticking noise because I couldn't hear it. Then one night, as I was going to sleep, to my surprise, I could hear my watch ticking quite loudly. The reason I could suddenly hear it was because the room was absolutely silent. In the same way, if we want to know the Lord and hear His voice, we need to find ways to stop the busyness within and without, and just focus on Him. Perhaps you can start with one or two hours a week where you don't use any social media, and you don't talk to anyone. Don't fill the time with a hundred prayer requests. Just read a Scripture, reflect on it and listen to what the Lord says to you. Let it be a sweet time of fellowship, and practice listening. You'll be surprised what difference a little silence makes in your ability to hear the Lord. There is a wonderful promise: "Draw near to God and He will draw near to you" (James 4:8). No matter what culture and time we live in, we always need to find a way to know our Lord and be with Him, even if we have to learn a new "old" skill, like quietness.